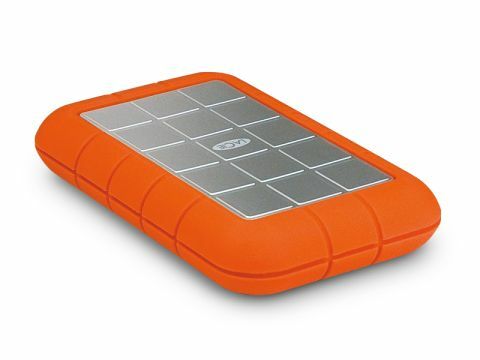 The name of the Lacie Rugged immediately gives you a good indication of the aim of this eye-catching external hard drive. Lacie has opted for a robust plastic box that cradles the hard drive inside, and will absorb any shocks and knocks should you drop it. To add further protection, there is also an outer rubber ring, finished in orange to contrast with the silver of the plastic casing. The rugged design is well suited to the same users as the Freecom ToughDrive Sport. This isn't a small or light unit, but you'll find that it certainly lives up to its name, being able to survive in most conditions with ease. That said, we would have liked to see the ports on the side of the unit also covered with rubber to add further protection against dust and dirt. When it comes to connectivity options this is one of the most competent drives, as you'll not only find USB 2.0 in place, but also FireWire 400 and the faster FireWire 800 connections included. There is also a power output that ends with a USB 2.0 connection for use with older devices or for when you find your laptop isn't delivering sufficient throughput. We didn't find this a problem, but you may find yourself having to use up two USB ports with this drive. Lacie supplies this drive with hardware drivers for all Windows operating systems, as well as Apple's Mac OS X, allowing you to format the drive to suit your needs. When formatting the drive, you can also easily create separate partitions for either OS. When it came to testing, we found this a reasonable if not super-fast drive. As expected, the FireWire 400 and 800 connections proved faster than USB 2.0. The Lacie Rugged lacks some of the charm of the Freecom ToughDrive Sport in terms of design and, while it shares a similar weight, it is considerably more bulky. However, for sheer versatility when out and about in extreme locations, this is the better choice.